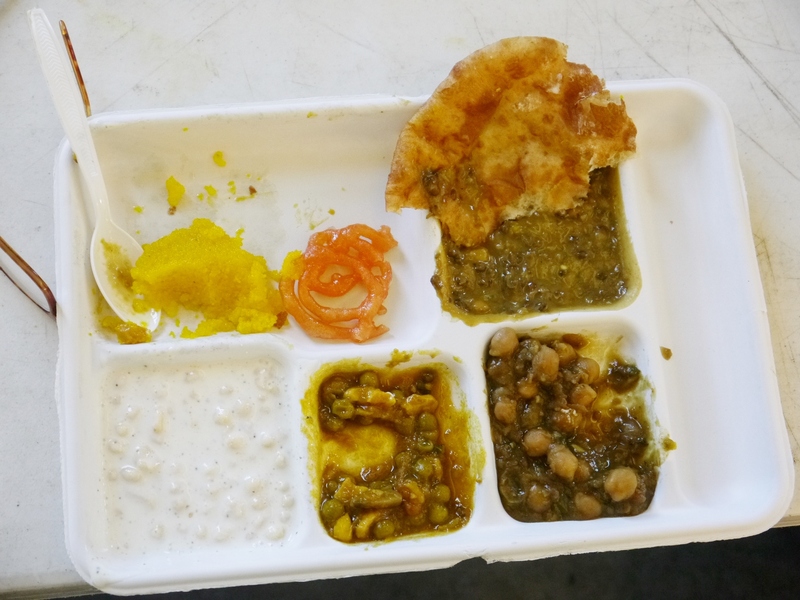 “It’s like we’re in a foreign country”, my wife commented as we stood inside the dining hall of the Sikh temple in Yuba City, California on Sunday afternoon, April 17, 2016. As far as I could tell, we were the only white people, or as Dr. Shumate from the Sutter County Library might say, “Caucazoids”, in that room of well over two hundred people. 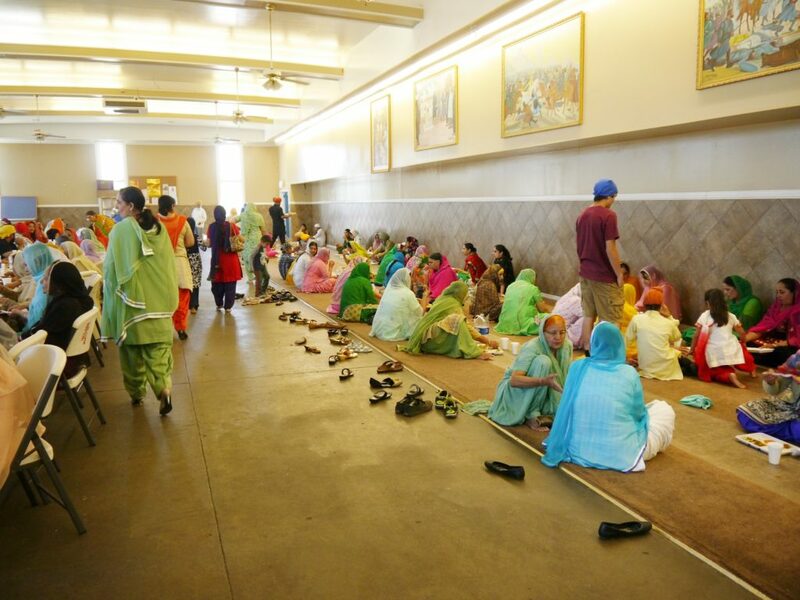 We were visiting the temple because the Sikh Community Outreach of Yuba City had invited the public to join them in celebrating Family Day, and to learn about the meaning of Vaisakhi, or the birth of Khalsa. This was not our first visit. On one earlier occasion an official of the temple had asked us how they could get more people like us to come. “You mean white people?” I commented. “Not just white people, but people that aren’t Sikhs”, he replied. I didn’t have much to say at the time, but since then I’ve visited a multitude of places of worship while researching material for my blog, LeavingLinda.com. In doing so I have observed how other groups handle their new guests. 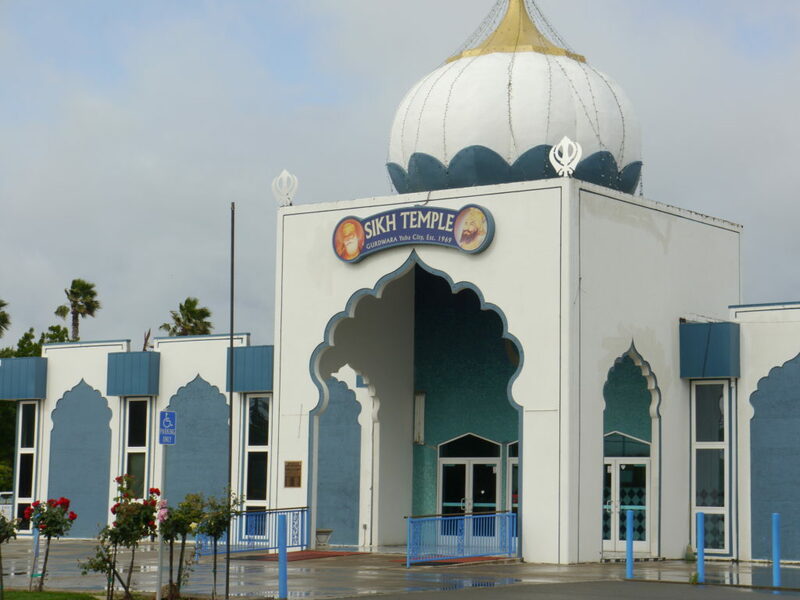 Hopefully I can offer some insights into how the Sikh temple can get more visitors, and also enable those visitors to gain more from their experience. 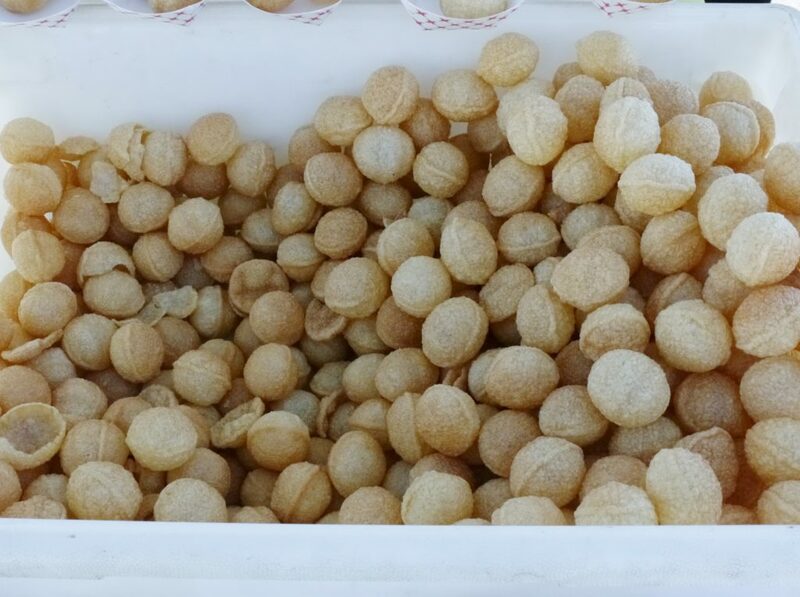 Golgappa, deep-fried pastry ready to be filled with flavored water and desired filling. On our recent visit, after parking our car, we walked over to where several canopies were set up, and looked around. We were treated to some servings of “golgappa” at one booth, where the mostly young volunteers were friendly and informative. 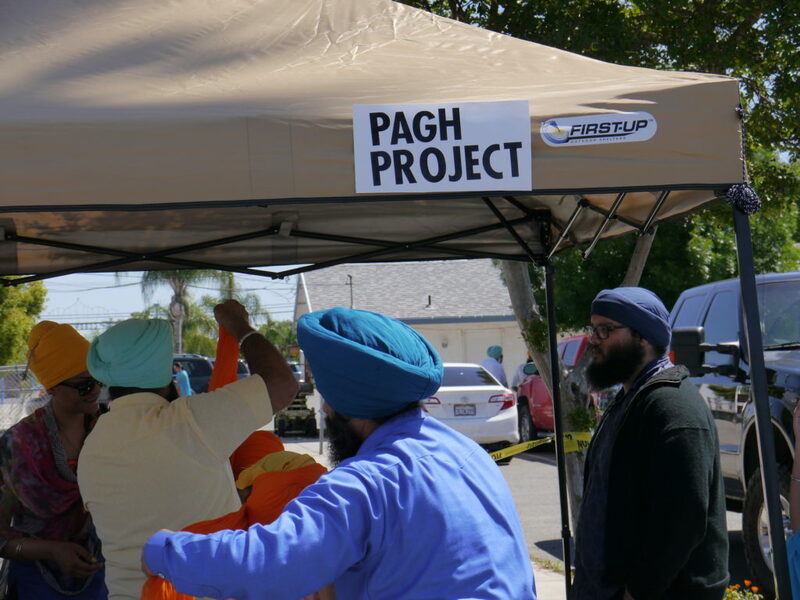 We then passed the “Pagh Project” where a turban-tying demonstration was taking place. After visiting a few more booths and wondering what to do next, I happened to recognize a temple member, whom I know from my Toastmasters Club, walking by. “Bob! what brings you here?” she replied. “I heard there’s free food.” I chuckled. After getting directions my wife and I began walking towards the dining hall and knew we were close when we could smell the pleasant aromas of Indian food cooking. 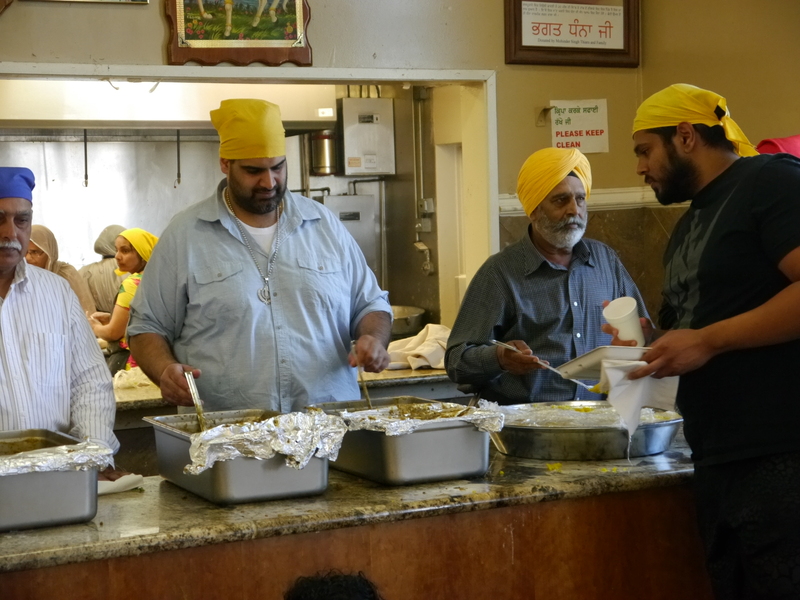 We walked inside, stood in a short line and, after having our Styrofoam plates piled generously with naan bread and other items, we looked for a place to sit. The right side of the room was lined with mats where mostly women and children were sitting. I opted to sit at the cafeteria style table and bench at the left side of the hall, and my wife followed. As we started to sit down, my wife noticed that only men were seated at those tables and, anxious to comply with temple etiquette, she asked if it was alright for her to join them. Several men nodded their heads yes, assuring her it was fine. A true Sikh is required to worship one god, give to the poor, abstain from drug and alcohol use, never commit adultery and live by many other noble virtues. The Christian Bible tells us you can know people “by their fruits”. Personally, I never doubted that the Sikh religion was inspired by God; my visits to the temple and interactions with local Sikhs have only confirmed that. Good to have you back in the Interfaith reporting business Bob. Cute title. It would be great if the houses of worship that you visit would be humble enough to want you to give them feedback on what a guests experiences at their gathering. It would do all of us a service, to see how things are from fresh eyes. Thank you Kevin. Perhaps I could hire myself out as a “Secret Shopper” specializing in places of worship. Although I do believe that service already exists. Thanks Bento. I’ve always wanted to be a restaurant critic. Maybe this is my start. Nice blog, Bob! I m glad you visited the Sikh Temple, our yearly Sikh Parade i.e. Nagar Kirtan is coming up soon in Thr first weekend of Novber. The preparation & worship starts in October, our family will be sponsoring the program Oct. 13-14-15 if you & your wife can visit during those days I will be there to answer many of your questions. Just two for now, Khalsa is not just the tenets; it is the people who truly follow those tenets and Vaisakhi is the beginning of Indian & Sikh New Year. Oh as for Joyce, yes I saw it and sent her a message congratulating her, didn’t here back, she hasn’t put my name on the schedule yet either. I would love to visit the temple as a guest and learn more about the religion, are there times/dates for visitors? Bonnie, I’ll contact some of my Sikh friends to find out when would be the best time to visit. Thank you for reading my blog. Hey Davi, AKA Alex, glad to hear from you. I’ll message you on Facebook.